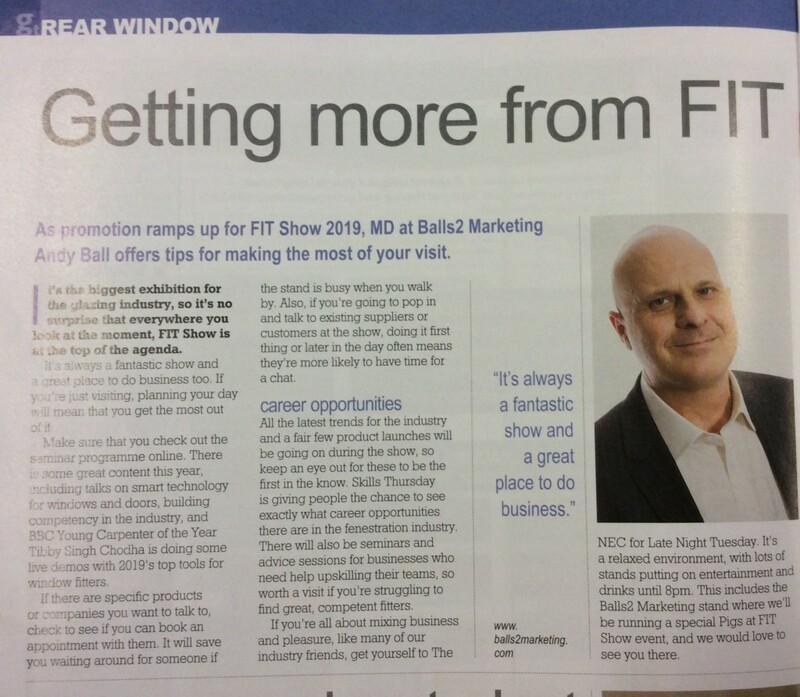 As promotion ramps up for FIT Show 2019, Managing Director at Balls2 Marketing, Andy Ball, gives his tips for making the most of your visit. It’s the biggest exhibition for the glazing industry, so it’s no surprise that everywhere you look at the moment, FIT Show is at the top of the agenda. It’s always a fantastic show and a great place to do business too. If you’re just visiting, planning your day will mean that you get the most out of it. Make sure that you check out the seminar programme online. There is some great content this year, including talks on smart technology for windows and doors, building competency in the industry and BBC Young Carpenter of the Year Tibby Singh Chodha is doing some live demos with 2019’s top tools for window fitters. If there are specific products or companies you want to talk to, check to see if you can book an appointment with them. It will save you waiting around for someone if the stand is busy when you walk by. Also, if you’re going to pop and talk to existing suppliers or customers at the show, doing it first thing or later in the day often means they’re more likely to have time for a chat. All the latest trends for the industry and a fair few product launches will be going on during the show, so keep an eye out for these to be the first in the know. Skills Thursday is giving people the chance to see exactly what career opportunities there are in the fenestration industry. There will also be seminars and advice sessions for businesses who need help upskilling their teams, so worth a visit if you’re struggling to find great, competent fitters. If you’re all about mixing business and pleasure, like may of our industry friends, get yourself to The NEC for Late Night Tuesday. It’s a relaxed environment, with lots of stands putting on entertainment and drinks ‘til 8pm. This includes the Balls2 Marketing stand where we’ll be running a special PiGs at FIT Show event and we would love to see you there!